On April 2-3, Westtown School will host a robotics competition with an unusual (and incredible) twist. Westtown School will host the FIRST ® Robotics Mid-Atlantic District Competition on April 2-3, from 9 a.m. - 6 p.m. 38 teams, comprised of more than 1,000 students, will participate in this year’s medieval-themed event attempting to “breach their opponent’s defenses” and “capture the tower.” At the end of most competitions, one team is victorious and is deemed the winner. At Westtown’s event, however, a different “win” will take place. 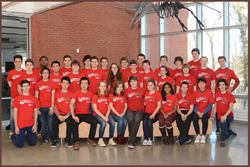 Now in their 13th year, Westtown’s Metal Moose robotics team has won 13 awards for performance, design, innovation, systems control, and creativity in engineering. They have qualified for and attended the Robotics World Championship five times and grown from a team of six students to over 40. While these are impressive achievements, perhaps their desire to give back is one of their best. Westtown School is a Quaker, independent, PK-12, day and boarding school with a commitment to educate and empower its students to be changemakers. Situated on a 600 acre campus, Westtown is a place where students develop habits of action: thinking, caring, risking, speaking, collaborating, researching, and problem solving. Westtown believes in the talents of each student and the importance in giving them opportunities for leadership and independence. The school’s classrooms are animated by intelligent joy and reflective community work where children are challenged by their teachers, by themselves, and by each other. Yet, powerful education reaches far beyond the classroom. Westtown's mission is to inspire and prepare its graduates to be stewards and leaders of a better world.